ENUGU (DAILY SUN} Igbo leaders from the five South East states, under the auspices of Mkpoko Igbo, have endorsed the joint presidential ticket of Atiku Abubakar and Peter Obi for 2019 general elections. They lamented the precarious situation the Igbo have found themselves in the country, in the face of their obvious exclusion from the centre in recent years, and, therefore, said the survival of Ndigbo in Nigeria depends on the actualisation of the Atiku/Obi presidency. The summit, which held yesterday, at Nike Lake Resort Hotel, Enugu, with the theme: “Ndigbo 2019 and beyond,” and chaired by elder statesman, Prof. Ben Nwabueze, was attended by the cream of Igbo society, led by President General of Ohanaeze Ndigbo, Chief Nnia Nwodo. Other prominent participants were the Obi of Onitsha, Igwe Nnaemeka Achebe, Senator Ben Obi, Prof. Ben Nwabueze, Senator Chris Anyanwu, Chief Achike Udenwa, Chief Onyema Ugochukwu, Prof. Anya O. Anya, Chief Emeka Ugwu-Oji, Amb. Frank Ogbuewu, Amb. Lawrence Nwuruku, Senator Enyinnaya Abaribe, Prof. A.B.C. Nwosu, Prof. Uche Azikwe, Amb. George Obiozor and former Ohanaeze president general, Chief Gary Igariwey. A communiqué read by Olisa Agbakoba, SAN, stated that their vote for Atiku/Obi presidency was based on the restructuring agenda the duo have put on the table, which the four geopolitical zones of the country has already agreed on. He said: “This is my last wish before I join my ancestors. 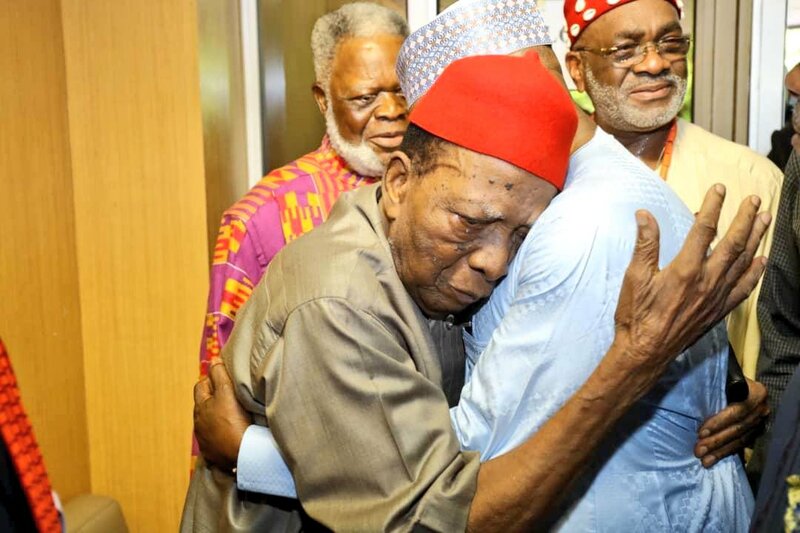 Nwabueze, however, noted that he would not rest until a sense of belonging was achieved for Ndigbo and prayed the leaders to continue to work in unity.